Users of wireless keyboards...cheap keyboards available from Woolies for $2.00 ea. Thread: Users of wireless keyboards...cheap keyboards available from Woolies for $2.00 ea. Drop what you're doing ...grab your hat and cane,or whatever...rush straight to Woolies,electronic/area. 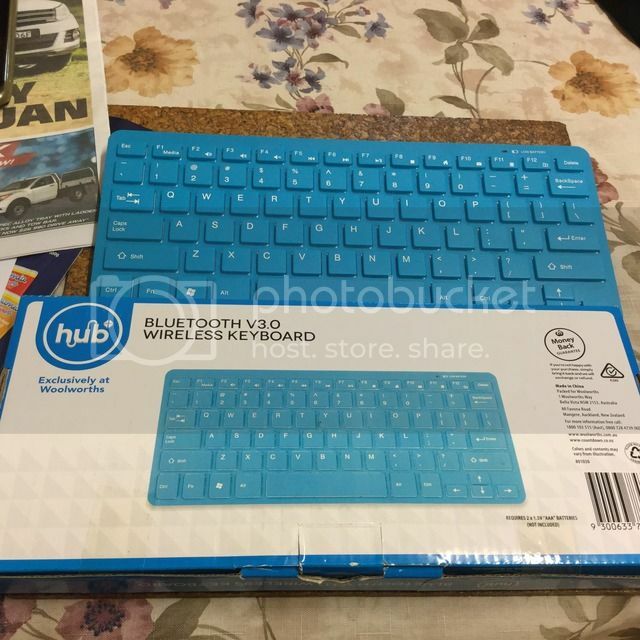 I have just got six of these "hub" brand bluetooth Version 3 compact key boards,just wonderful for all the apple devices as well as other non apple,everyone just worked perfectly...out of the box (batteries ,not supplied). Hard to understand how these could be sold for this price,the box alone would cost more! Your choice of colour is limited to pink or blue however,black is available also if you're prepared to pay the ticketed price...$23.00!!! Seems that these have been available for the last week,not well publicised.Using this keyboard right this moment,yes I realise it's a PC layout ,it works well for me. I noticed that there were quite a few remaining ,i suspect not many people know about them yet. Looks like "first in best dressed"! Subtle plans are here again! If it has an engine or a heartbeat it's going to cost you. Here's a picture of the keyboard! Looks like the same one that I have in the car for the carputer (which I got from Woolies about 9 or so months ago). Its not the best keyboard...the Apple Bluetooth keyboard is much, much nicer to type on but its cheap, compact and does the job. I was going to, but then I realised that I already have a BT keyboard I can use here, which I did try to sell off (its an iPad 2/3/4 one) and nobody wanted... and I've found it works perfectly well with the Mini, and the AppleTV. I've allocated it to appleTV use. FYI: Try the Apple remote app for your iOS device for controlling the AppleTV. As a remote it's as basic as the few stock button, but when you enter a text field it brings up the keyboard. Very handy to have, especially if you don't have a spare keyboard laying about. (That and your phone is probably right there all the time anyway). I am thinking to try a black one if still available. All times are GMT +10. The time now is 03:55 AM.